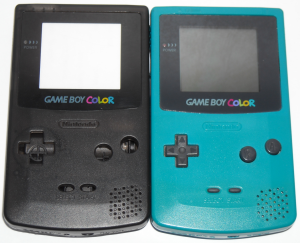 After how much I liked the DMG shell I reviewed last time, I submitted my review to the vendor and asked if they would provide me with one of their Game Boy Color shells to review. Much to my surprise they appreciated my review and agreed to send me out a Game Boy color shell. A big thank you goes to Orient Mall on Amazon! The last time I bought an aftermarket shell for the GBC I was hoping I could swap out a well beaten green shell and add a yellow GBC to my collection. What I ended up with was a cheap, slightly transparent shell that, once I bought a real yellow GBC, turn out to be worse than I originally thought. This time I’ve decided to go for a transparent black custom with further customizations to come. Once the Orient Mall kit arrived I was pleasantly surprised with everything included. 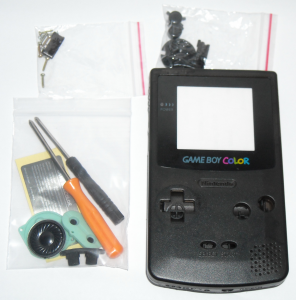 Just like the DMG shell this kit comes with the tools, but this time the kit came with a full set of screws, a sticker for the back of the shell and even a speaker replacement, which seems to be a common problem with aging Game Boy Colors these days. 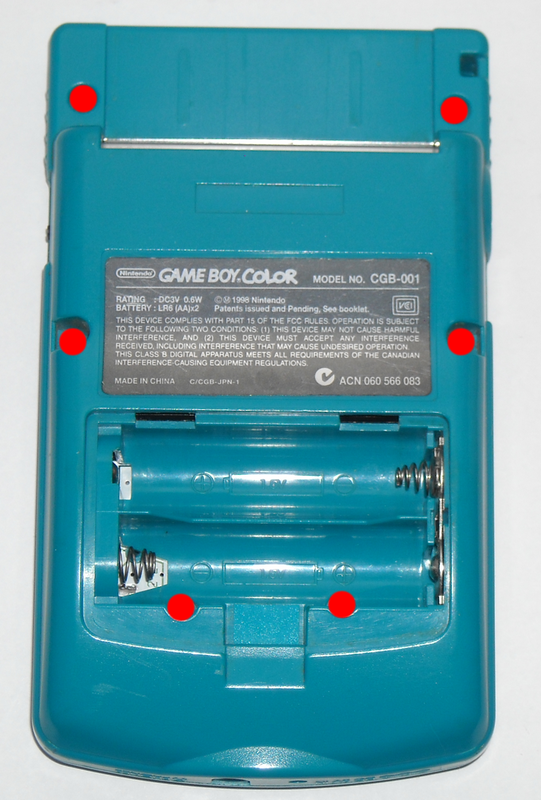 Since I already have a full set of screws, the speaker on my donor GBC works, and I already have the tools from the DMG kit, I won’t be using these, but it’s still nice to see them included for those who need them. Now I will be putting together a brief tutorial on how to take your Game Boy Color apart. 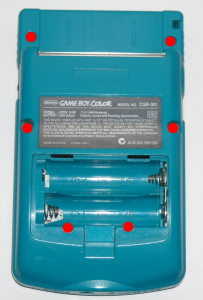 First you’ll need to flip your GBC over and remove the battery cover (as well as any batteries you may have inside that compartment) and remove all six tri-wing screws on the back. 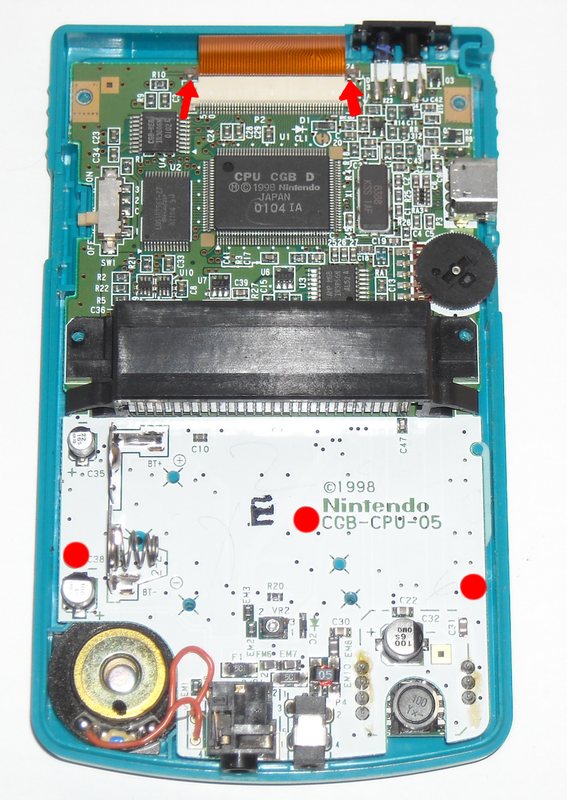 You should now be able to remove the back part of the shell, revealing the guts of the system. You will now have three phillips screws holding the motherboard into the case. Once all the screws are removed and set aside you’ll need to carefully release the screen’s ribbon cable from the top of the motherboard by sliding the tension pieces upward. Now that the ribbon cable is free from motherboard you can remove the motherboard completely and set it aside. 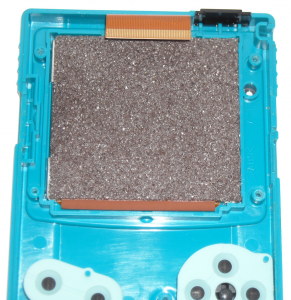 Keep in mind that if this is the first time your GBC has been taken apart the screen will be attached to the front part of the shell by double sided tape. Now this can be a bit tricky but all you should need to do is gently pry up from the bottom of the screen and break it loose, without breaking the screen or damaging the cable. It’s not as delicate as you might think, but it’s always safe to err on the side of caution. Once everything has been removed from the old shell I decided to cut the screw threads on the new shell for all of the mounting holes. Since this is a transparent case I took extra care to not torque the screws down too far in areas where a mistake could easily be seen. I did, just to show you what kind of milky white mess you could end up with, bottomed out the screws which will be hidden by the screen cover, as seen below. Again, reassembly will be the mirror of exactly what you did to take the whole thing apart. Before you put everything back together I would highly suggest cleaning any contacts on the motherboard or the rubber pads for the buttons, to insure better functionality. 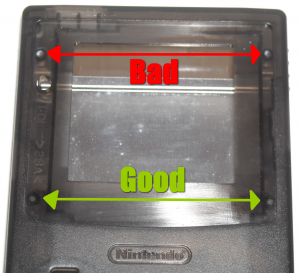 One thing to note is that the new shell will not have the double sided tape to hold the screen in place. After putting the motherboard back in the foam on the back of the screen seems to hold it in place perfectly, though if you have double sided tape and want to put it down just in case you can do that as well. What I like about this kit: The fact that it comes with an extra speaker, tools and a full set of screws, even though they’re not tri-wing. Unlike the odd molding on the previous GBC shell the battery cover from this kit will fit, albeit snuggly, on an OEM shell. 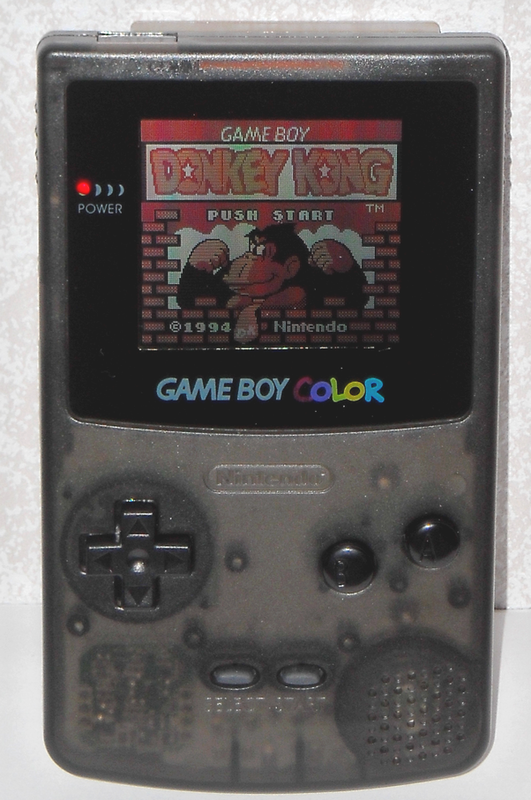 The shell doesn’t feel cheap and the texture makes it feel like what a brand new GBC might have felt like all those years ago. 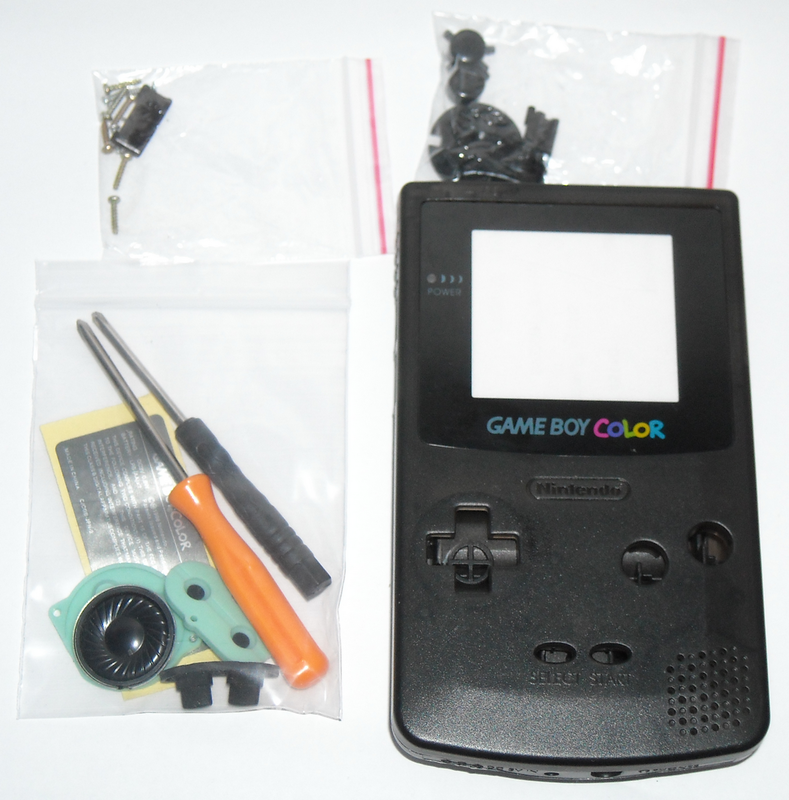 This time around the buttons for the GBC kit were perfectly molded and worked perfectly, they’re also much darker black, at least with the kit I received, making it look even more awesome. What I don’t like about this kit: The included battery terminals for the back are too tall, which never allowed the battery cover to sit flush. This could easily be fixed by trimming them down, but since I already had one from the OEM shell I chose to just use that instead. 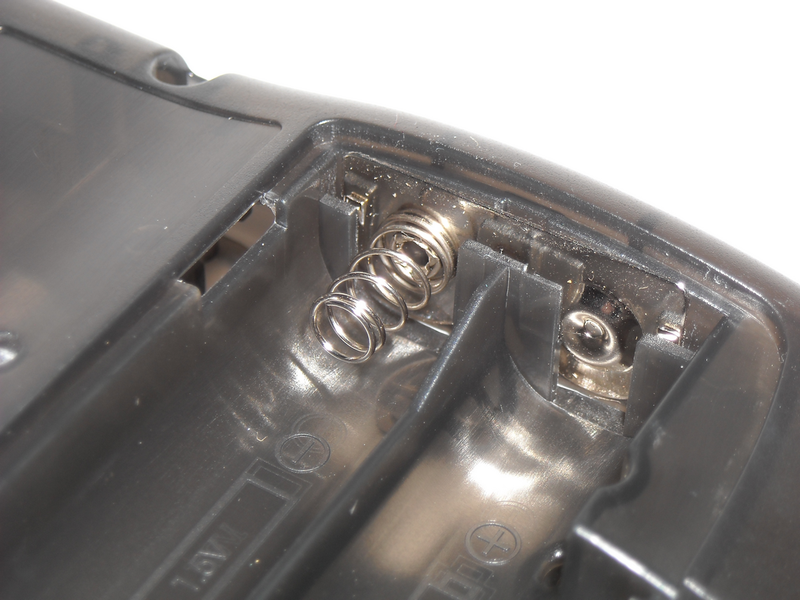 The molding seems a bit messy around some of the conjoining edges. Once everything is screwed down tight everything fits together, but the seam between the parts is a little wavy in areas. And finally the OEM power switch doesn’t seem to work very well with this shell, and the included power switch is a bit too tight for my liking. It’s functional, but a bit too tight. Like I said before I plan to do a few more customizations to this and I’ll probably be posting those later, depending how in depth they are. If you want one of these kits you can find them on Amazon. Readily available, inexpensive and Orient Mall has really fast shipping. 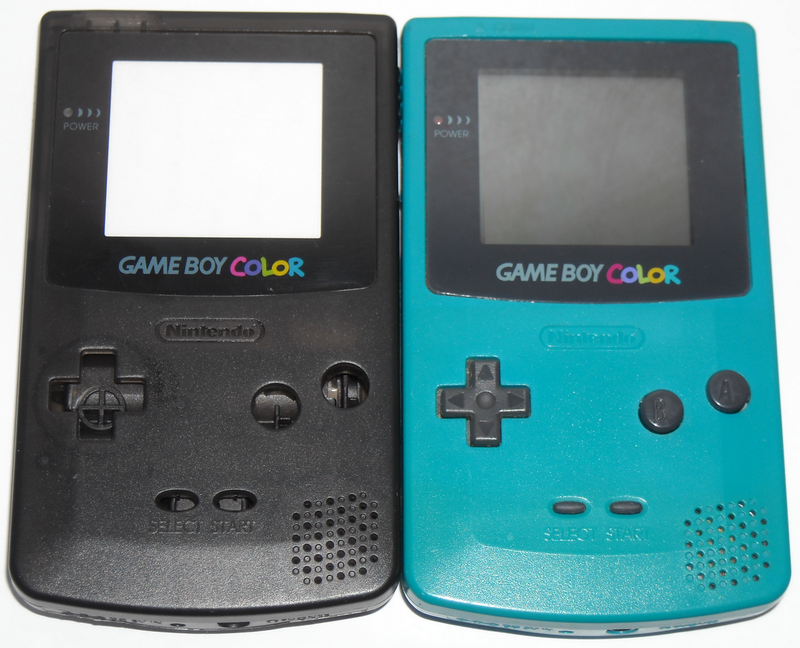 Whether you’re wanting a total custom, a total repair or just looking to freshen up your Game Boy Color, these kits are really good value for what you pay and what you get.